The 2017 World Championships were held in Palm Springs this past week and were a tremendous success. 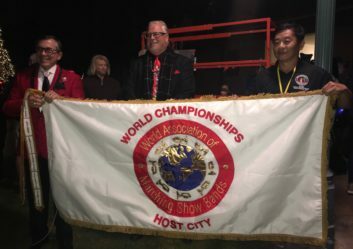 Bands from China, Germany, Poland, the Czech Republic, Brazil and the United States participated in multiple days of events showcasing Concert bands, jazz bands, Parade competition, Drumline competition, and the “Field Show” Showband competition. An international panel of expert judges hailed from the Netherlands, Germany, Canada and the United States who had the difficult task of determining the champions. Results are posted on our event page. Congratulations to all the participants and organizers on a fantastic championship. This event marks the first time the WAMSB World Championships were held in the USA, and it was a wonderful week. Many pictures and videos from the event are posted on the WAMSB Facebook page. 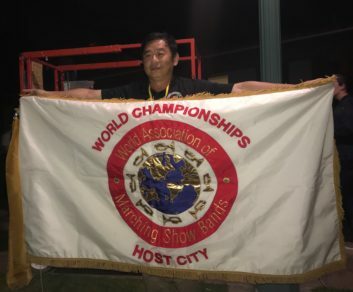 The WAMSB Host City flag was officially passed from Mr. Robert Moon, Mayor of Palm Springs, and Mr. Brian Ingelson, Co-Director of the 2017 Championships to Mr. Canon Huang, Director of the 2018 Championships being held in Taipei, Taiwan. Mr. Huang would like to invite all bands to come together for the 2018 Championships being held in Taipei from July 25 – 29th, 2018. Information on how to participate is on the WAMSB website.